How Digital Marketing can help you in many ways? EduPristine>Blog>How a Digital Marketing course can help you? How Digital Marketing can help established Business persons? How Digital Marketing can help aspiring Business persons? Looking for an idea for starting a new business? How about starting up a Digital Marketing Agency? Digital Marketing is one of the most popular industries to get into. Infact, in US alone the industry is worth $62 billion. Achieve Specialization – To avoid competition and to stay ahead, it is important you specialize in a particular area or field. If you think that you have more knowledge on Social Media Marketing then try starting a social media agency and then you can expand your business. This will mean less investment and more chances of creating a niche. Hire less employees but capable ones– Your employees will decide whether your company will grow or no. It is always advisable to have a good mix of experience and freshness. Try Different things – There are a lot of new things developing everyday, try them. There are many free tools that will help you to track your performance and improve it, use them. Try the free trials of free tools and see if it is worth investing. According to smart insights, 28% of marketers have reduced their advertising budget to fund more digital marketing and on an average, 60% of a marketers’ time is devoted to digital marketing activities. This has fueled the demand for the digital marketing skills so if you are looking for growth in your current job profile then sticking to traditional marketing won’t help; you need to have knowledge about the digital world as that will help you in the long run. 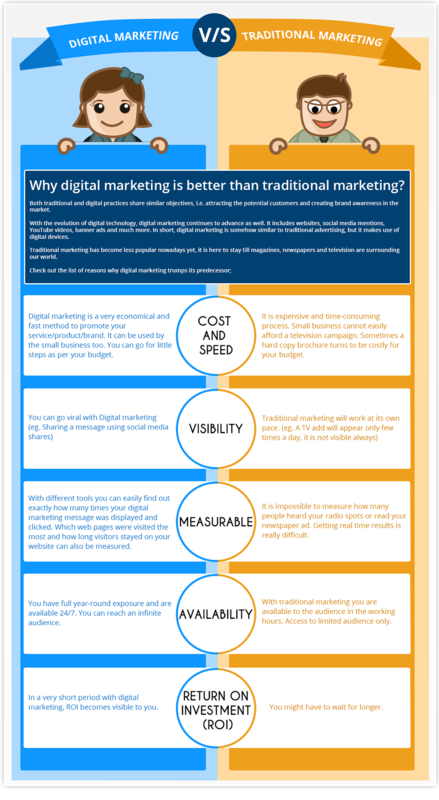 Why marketers should prefer Digital Marketing over Traditional Marketing? How Digital Marketing can help Bloggers? Do you have your own blog? If no then make one and if yes, then how well are you promoting it? The main purpose behind writing your thoughts is reaching out to maximum people and that won’t be possible just by posting links on your social media profiles. With millions like you, writing everyday it will be very difficult for your blog page to stand out. A Digital Marketing course can help you with that. It will help you in understanding various ways through which you can improve the visibility of your blog. If you have good reach, visibility and ranking, you can earn as well through your blogs. Recently I came across a site Blogmint where a lot of brands put in their requirements for articles, you just have to see which ones are suitable for your blog page and submit your article. Once approved, publish it on your blog page and earn the set amount. One of the bloggers charges Rs 50,000 for a single blogpost on blogmint. So now you can imagine the importance of having a blog that is a little famous. You can also earn advertising revenue by placing ads of others on your page. How Digital Marketing can help students? If you are a student confused about your career then you’ll be pleased to know that 1,50,000 digital jobs are predicted by 2020. With the Digital Marketing industry growing day by day, the demand for the people with digital marketing skills is increasing. 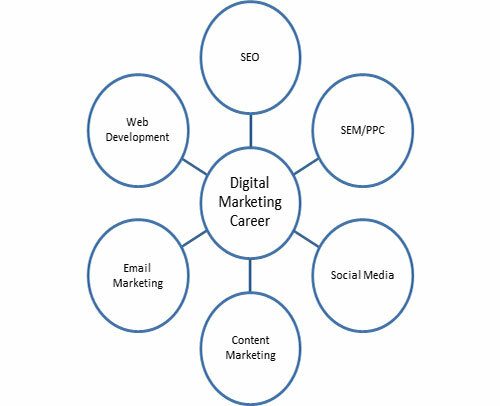 So making a career in Digital Marketing is a great move. If you love coding and are interested in making some amazing websites then you can either go for web development or designing. To get into this stream it is important that you have knowledge about HTML, CSS, Java Script and web programming. As a Web Designer it is important that you have good design sense and are aware about the design principles. SEO (Search Engine Optimization) is the process of optimizing a website and its content so that it can easily be indexed by Google and other search engines. Anybody who has a website needs a dedicated SEO Team in order to stay ahead and this has increased the demand for the SEO professionals tremendously. As a SEO professional you should have basic idea about various On Page & Off Page Optimization techniques, various ranking factors, Black Hat & White Hat SEO etc. SEM(Search Engine Marketing)/PPC (Pay Per Click) is a kind of internet advertising in which the advertiser pays an agreed amount to a search engine for every click a visitor makes on the advertisement. Usually it takes a lot of time for SEO efforts to show results in the search engines and therefore companies also invest in SEM. A SEM professional can work in a digital marketing agency or inhouse for certain brand. Strong analytical and quantitative ability is a must for SEM. Who thought that one day you’ll be paid for Facebooking and Tweeting all day. Well social media marketing is not only Facebook and Twitter but they form an important component of it. Social Media Marketing includes building campaigns for various social media platforms , measuring results from the same, analyzing that results and making necessary changes. As a Social Media Professional you’ll be co-ordinating with the clients on daily basis. Today, with almost every brand having their presence on social media, social media marketing is one of the best career choices. Knowledge about all the social media platforms and a lot of creativity are a must for this job role. Content marketing in 2015 generated 3 times as many leads as traditional outbound marketing, at 62% lesser cost. So now you know the importance of content marketing. Content is the thing that will make difference to all your SEO, SEM and Social Media Efforts. If you have your content in place then it becomes really easy to rank on the search engines. Good content will always assure clicks on the ads and likes and shares on social media. As a content marketer, you will not only be creating great content but will also be responsible for promoting it. A content Marketer has to work with other teams closely and therefore should have the basic knowledge about SEO, SEM and Social Media. One of the sure ways to reach to your customer is through Emails and thus companies are investing a lot of money in email marketing. Signing up for a newsletter while going through a website can be taken as an example of Email Marketing. Email Marketing is used for communicating offers, new product launches, providing discounts etc. Email Marketing may also require some coding and therefore knowledge about basic HTML works as an advantage. These are only some important fields, there are various are fields that are developing everyday like CRM, Affiliate Marketing, E-Commerce marketing etc. 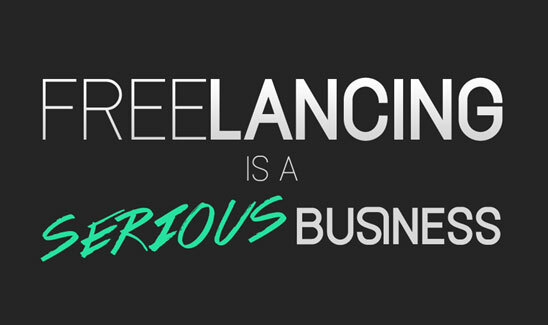 How Digital Marketing Can Help Freelancers? If staying at home and earning money is your thing then Digital Marketing is for you too. As mentioned above you can start your own blog. There is a site called Fiverr where in you can list your skill like logo designing, video creation and promotion, writing, social media marketing etc. and people shall contact you for your services. Good knowledge will ensure more orders and more money. I hope now everyone has got an answer to the question “How Digital Marketing Course can Help me?” If you still have any doubts then feel free to mention them in the comments box below and I shall try my best to give you a valid reason. And if you are convinced and want to join, register for our Digital Marketing Program .